Telephone box library – bring us your books! 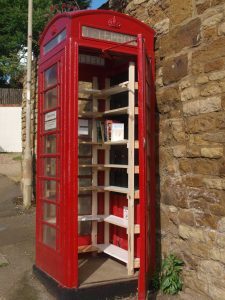 > News > Uncategorized > Telephone box library – bring us your books! The red phone box on Rockingham Road, Cottingham has been given a new lease of life as a mini library. The phone box has been fitted out with 32 feet (almost 10 metres) of shelving and is now ready for some books! If you have any books you would like to donate, please just pop along to the phone box and pop them on the shelves. The library will then work on a ‘take one, leave one’ basis. Many thanks to Mike Curtis and Sue Trengrove whose efforts have helped transform the phone box into a quirky and useful facility.